Ford India has listed prices of all six variants of the Endeavour that were originally launched, including the manual ones. Interestingly, the base manual trim is just Rs. 22,500 cheaper than the base automatic. We told you last month that the manual variants of the Ford Endeavour SUV were silently discontinued in India. The American automaker had unlisted the 2.2 4x4 MT Trend and the 3.2 4x4 AT Trend trims on its website, while also removing it from the brochure. 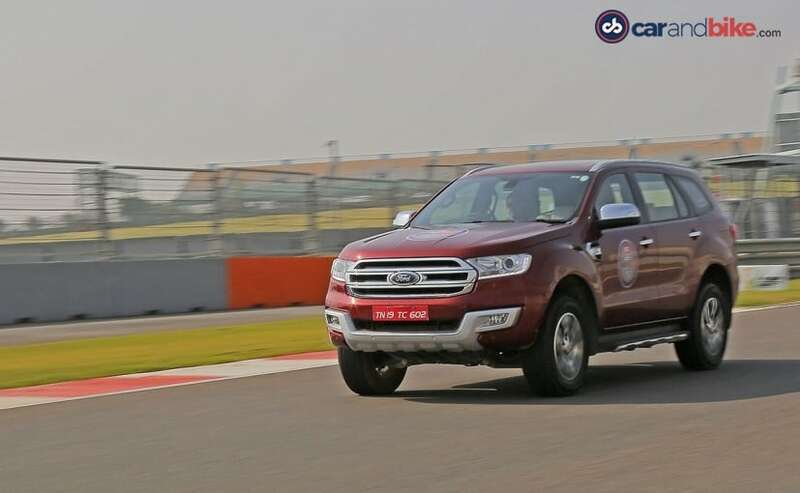 However, it now seems that the discontinuation might just have been temporary and Ford India will continue selling the manual variants of the Endeavour. As per a leaked document from Ford India to its dealers, the automaker has listed prices of the discontinued variants as part of the new post-GST pricing. 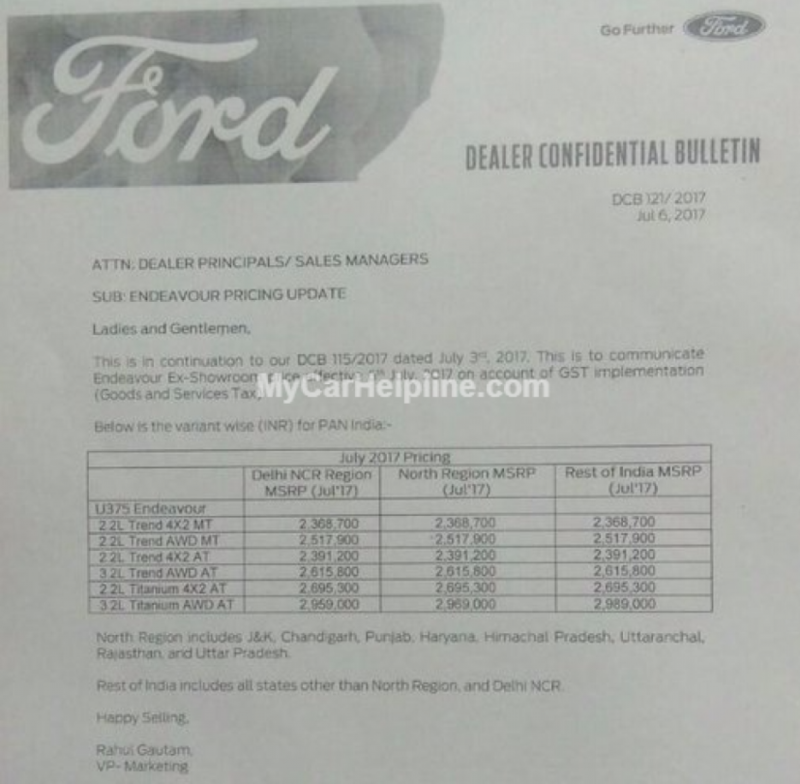 While Ford's Indian website only lists the automatic versions of the Endeavour, the bulletin provides the complete price list across all six variants that were originally launched. Prices for the Ford Endeavour now start at ₹ 23,68,700 for the 2.2 Trend 4x2 MT, while the range-topping 3.2 Titanium 4x4 AT now starts at ₹ 26,59,000 (post GST-prices, ex-showroom India). Apart from the new prices, the bulletin does not suggest any other changes. The new generation Ford Endeavour was introduced in India in 2016, and has been a long due update for the SUV. The all-new model has been warmly received in the market owing to the plethora of changes, creature comfort and spot on pricing. In fact, with Ford passing the GST benefits to customers with effect from 1st July 2017, the Endeavour has seen a price cut of ₹ 1.91 lakh on the top-end trim. In markets like Mumbai, the SUV has seen a price reduction of around ₹ 3 lakh, owing to the omission of state taxes like Octroi. As per the new Goods and Service Tax (GST), SUVs more than the size of 4 metre will fall in the 43 per cent tax slab - 28 per cent GST + 15 per cent Cess; instead of the previous 55 per cent taxation. As a result, all SUVs have seen a massive price cut across including the Toyota Fortuner and Isuzu MU-X.